View Inspired Setting ! Pristine, single level home w/ large attached & detached garages. Nestled up, above Trinity Lake, behind gated country road & just 3 neighbors. Master suite features amazing views from slider; step out to spacious, trellis covered patio & VIEWS ! Soaking tub plus separate shower & large walk in closet tops off the suite. Split floor plan: Master Suite located on opposite end of home from bedrooms 2 & 3. Sun room, w/ access from kitchen & rear patio, is a year round crowd pleaser; the VIEWS are just amazing ! Cook's kitchen w/ all appliances, plenty of room for helpers; spacious eat in dining, breakfast bar & appliance counter w/ open area to living. Oval-style sitting room or optional formal dining elegance.Vaulted ceiling living room w/ tall windows looking out to wrap around, covered patio. Tiled flooring from interior garage access, laundry, hallway, kitchen & dining area; smart w/ country living. Bathroom between garage & laundry is useful after a long day on the lake, in the ALPS or just enjoying your own 5 acre country grounds. 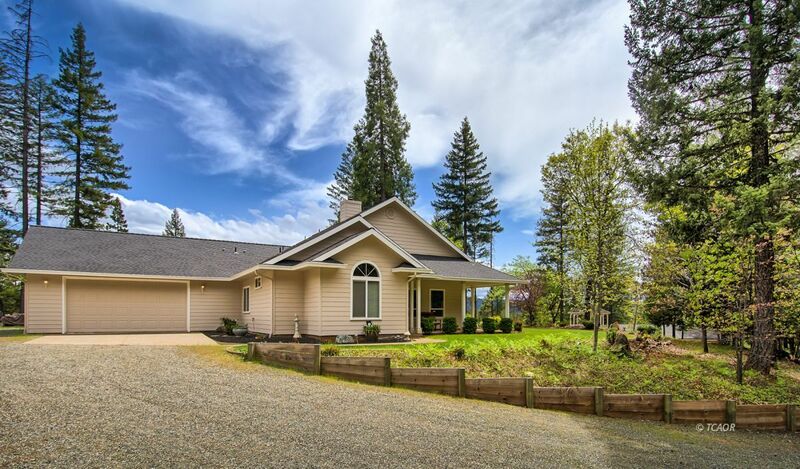 Plenty of room for recreational toys w/ 2 garages, side parking & full driveway. Savor the best Trinity has to offer !